This summer, COBA will host two different study abroad programs in Europe. In June, a group of students will travel to Oxford, outside of London, for a month of coursework and consulting with OxFam, International. This will mark our 12th summer in a row to take a group of business students to study and consult in Oxford. 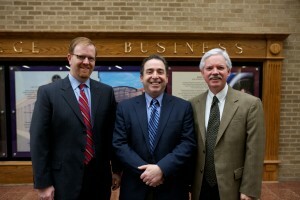 Students will take classes in International Business, Management and Organizational Business, and Operations Management. And in July, a second group of business students will travel to Liepzig, for the first part of the month, and wrap up their time in Oxford. Classes will include: International Marketing, European Strategic Marketing, and Issues in Global Information Technology. Additionally, students will have the opportunity to work on projects for KaDeWe (a high end German department store), BMW and Harrod’s. For more information on our study abroad programs, click here. Now, take a break from wedding coverage and watch a few episodes of our time in Oxford from the summer of 2009. From time to time on this blog, we’ll be featuring brief conversations with recent COBA alum, asking them to share how ACU has prepared them for where they are now. 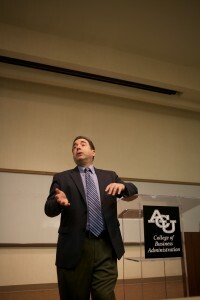 Jody Walker graduated from ACU with degrees in Accounting and Finance in 2009. While at ACU, Jody played on the Wildcat football team, was a member of STAR, and was a winner in the student category in our 2009 Springboard Ideas Challenge. He’s currently studying at SMU’s Dedman School of Law and is candidate for his Juris Doctrate in 2012. We’ve asked Jody to share with us how ACU prepared him for his next steps, specifically law school. 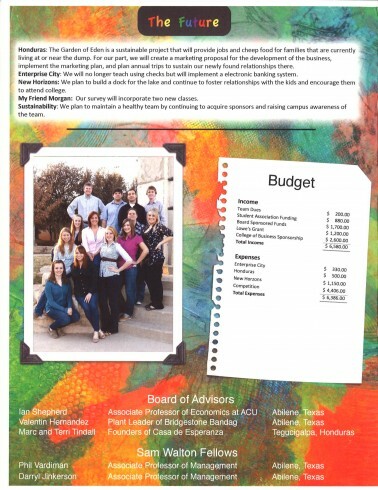 1) How was your learning experience at ACU (or in COBA) different from that of your classmates at SMU? One of the biggest differences was the technological innovation used throughout the university. Professors would take surveys on iPhones, Q & A’s would be done through text messaging in chapel and even some of my tests were taken with a remote control. None of my other classmates in graduate school had experienced a university that incorporates technology so seamlessly into thestudent bodies’ daily activities. 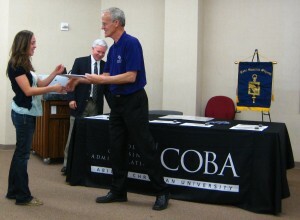 With this exposure to a cutting-edge learning environment, ACU (and COBA) gave me more than just a “textbook” education. 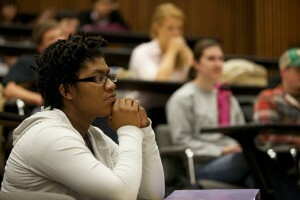 2) Do you think your learning experience at ACU provided better preparation than your classmates’ college preparation? If so, how? If no, why not? ACU (and COBA) definitely excelled at preparing me academically for graduate school, as well as for my future in the workplace. ACU is able to distinguish itself on many different levels from the typical public university, and I believe that one of the most beneficial aspects of ACU was the opportunity to improve my social skills. Sounds strange, but the constant communication with my professors and other students, daily interactions with classmates at chapel (not during chapel of course), and socializing at the numerous school activities all helped me develop the skills and attributes necessary to effectively communicate with the people around me. I feel like this intangible characteristic is often neglected at bigger universities, but with the personal environment ACU creates, it gave me the opportunity to develop meaningful relationships with the people I encountered in addition to learning invaluable interpersonal skills. 3) What class/program/event/professor helped prepare you the most for the workplace or grad school? What did they do that was helpful? STAR (Student Training and Research) was probably the most useful program in COBA. It was a real world application of the material I learned in class. At times it’s hard to comprehend equations and theories past the pages of your textbook, but STAR gave me the unparalleled experience I needed to succeed in graduate school. 4) Now that you are in law school, what is one piece of advice you’d like to share with prospective students or current students that would have helped you? Get involved, or stay involved with something at ACU. Whether it’s a social club, an organization, or some other extra curricular activity, the relationships you build at ACU are unlike any other. Thirty students recently earned the prestigious invitation for membership into The International Honor Society, Beta Gamma Sigma. 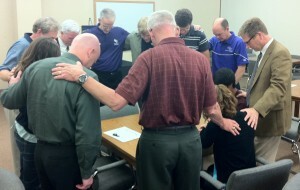 These students join the eighteen current student members and twenty-five faculty members in ACU’s chapter. To be eligible, students’ GPA is in the top 10% in our BBA program, and the top 20% in our MAcc program. Founded in 1913, the first national honor society in business was a merger of three separate societies established to honor academic achievement in business at the University of Wisconsin, University of Illinois and the University of California. Today Beta Gamma Sigma is an international honor society that provides the highest recognition a business student anywhere in the world can receive in a baccalaureate or post-baccalaureate (graduate) program at a school accredited by AACSB International. The mission of the International Honor Society Beta Gamma Sigma is to encourage and honor academic achievement in the study of business, to foster personal and professional excellence, to advance the values of the Society, and to serve its lifelong members. To begin our ceremony, Dr. Rick Lytle welcomed the new member students and explained some of the perks of membership into Beta Gamma Sigma. Besides lifelong membership and a really sharp medal they wear over their robes during commencement exercises, the new member students will also receive a free year subscription to BusinessWeek, Fortune and The Week. Additionally, students planning on sitting for the CPA will receive a $250 discount off of a Kaplan, Princeton Review or Becker review course. There is also a section on the BGS website with jobs that only BGS members are eligible to apply for. Dr. Lytle also shared that our current student members received a unique invitation from the University of North Carolina recently – automatic admittance into their MBA program, no GMAT score required! 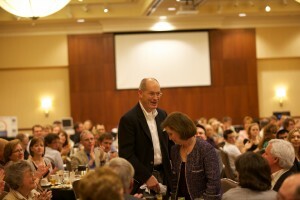 Before the official inductions, Dr. Terry Pope read a scripture from Psalms. 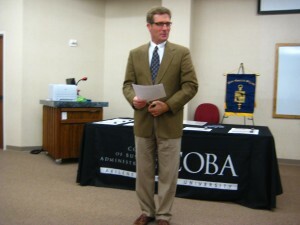 Then Dr. Monty Lynn and Dr. Don Pope inducted the new student members. After the new student members had received their certificate packets, Dr. Tim Coburn offered a prayer of blessing over these students. Congratulations to these students and their outstanding academic achievements! Our fourth annual Springboard Ideas Challenge Awards Dinner was another successful, educational and fun event here on campus. 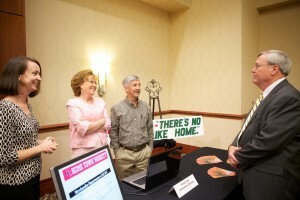 As guests gathered in Hunter Welcome Center, they could mingle through the many displays of the Ideas Challenge finalists, learning more about their business plans and ideas. 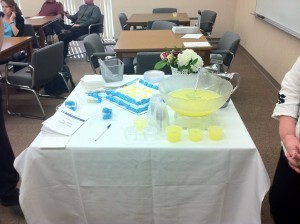 And in some cases, even tasting the finalists’ business idea. During the meal, we heard more about the Griggs Center for Entrepreneurship and Philanthropy from the Director of the Center, Dr. Jim Litton, as well as COBA dean, Dr. Rick Lytle. 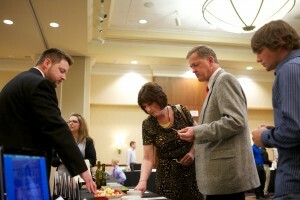 To be sure, the point of the awards dinner is to announce the winners of the small business plan competition. But the focus of the entire event and evening is to encourage entrepreneurship – to encourage the entrepreneurs, as well as to encourage the wider community that will support these businesses. 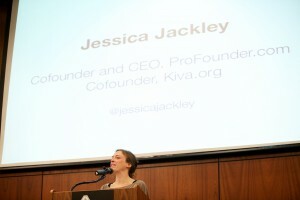 To speak further about the topic of entrepreneurship and community, ACU and the College of Business Administration was thrilled to bring in Jessica Jackley, co-founder of KIVA.org and most recently, founder of ProFounder.com. Jackley’s engaging, down-to-earth, completely authentic style had the audience laughing at different times and moved to tears at others. Here’s a nice recap of what she shared from the Abilene Reporter-News. And special Program Partner, Workforce Solutions of West Central Texas. We are grateful for the community of support we received in order to host this competition and awards dinner. Our events would not have been possible without the partnership of our sponsors, judges, contestants, COBA faculty, ACU staff and specifically, Dr. Jim Litton. If you are interested in learning more about our entrepreneurship program in COBA or how you can participate in next year’s Ideas Challenge, please email us at coba@acu.edu. Recently, students in Business Law and Introduction to Business, had the opportunity to hear from nationally known economist Dr. Russell Roberts. 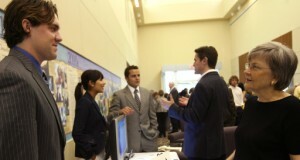 Dr. Roberts was invited to campus as part of the Undergrad Research Festival. 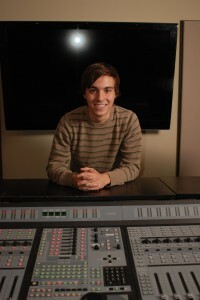 Russell Roberts, Associate Editor. Russell Roberts is Professor of Economics and the J. 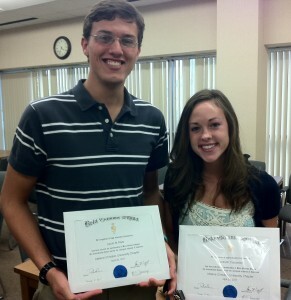 Fish and Lillian F. Smith Distinguished Scholar at the Mercatus Center at George Mason University. 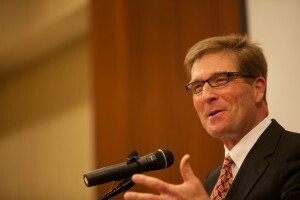 Before coming to George Mason University, Roberts was at Washington University in St. Louis where he was the founding director of the Center for Experiential Learning at the John M. Olin School of Business and a Senior Fellow at the Weidenbaum Center on the Economy, Government, and Public Policy. 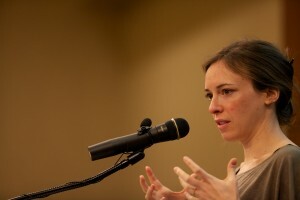 Roberts has also taught at the University of Rochester, Stanford University, and UCLA. He holds a Ph.D. in economics from the University of Chicago. Roberts is a regular commentator on business and economics for National Public Radio’s Morning Edition. In addition to numerous academic publications, he has written for the New York Times and the Wall Street Journal. 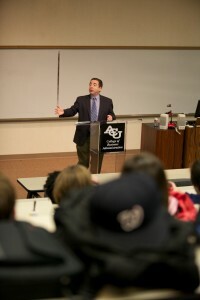 Professor Roberts is especially interested in communicating economics to non-economists. His first novel, The Choice: A Fable of Free Trade and Protectionism, a jargon-free book on international trade written for the non-economist, was named one of the top ten books of 1994 by Business Week and one of the best books of 1994 by the Financial Times. 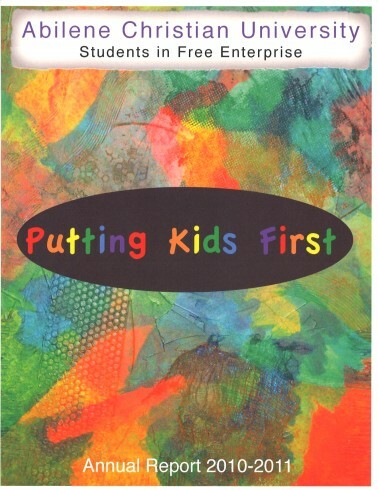 An updated and revised edition was published in the spring of 2000. His new book is The Invisible Heart: An Economic Romance (MIT Press, 2001). COBA faculty, staff, and MACC students and alums were thrilled and honored to learn recently that US News and World Report has ranked our MACC program as the #1 business graduate program in the nation in terms of graduate students who secure employment within three months of earning their degrees. Please read the University’s press release about it here. And here’s the article from US News and World Report. Congratulations to all the faculty and staff! And thank you to all the accounting firms and recruiters that visit our campus every semester to interview our MACC students. Lots of ACU students traveled to far away places during our March Spring Break. A couple hundred students traveled to cities across the US with Spring Break campaigns – volunteering and working with local churches. And several other students planned a trip with friends to go hang out in the sun on the beach, or to their hometown to rest and relax with their families. 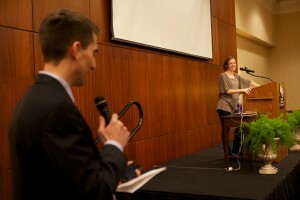 Five students from the College of Business had another idea altogether. 1) How many students went to Honduras? 2) What was the primary focus of the trip? To meet up with some 65 other college students from sister institutions (Harding, Freed, Lipscomb) and work with a local missionary (Marc Tindell) to serve the people in Honduras. The ACU students went to the “Dump” (landfill outside of Tegusagalpa) where people actually live and survive. Twice that week, they went to the Dump and fed the people living there. They provide beans, rice, totillas, and clean water. Two other days, they build houses for individuals that had no place to live. A house is a 16×16 structure with a floor, window, door and tin roof. For people who are used to having nothing, it is like a mansion. On another day, they went to visit the local hospital where they spent time with kids (some of which are dying). We provided hamburgers to the families that had kids in the hospital. 3) Tell us about three highlights from the group’s trip? See poverty up close and treating those people with love and respect. 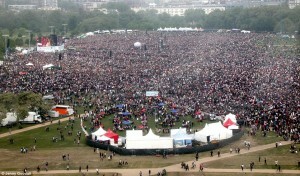 4) What lesson or lessons do you hope the students walked away with? To thank God for the blessings that we have and never take those for granted. Also, Jesus in Matthew 25 said that we are to feed the hungry, cloth the naked, and visit the sick. That is what we tried to do. 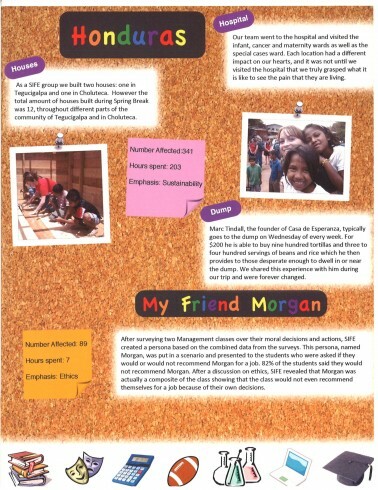 5) How do experiences like Honduras enhance the business principles our students are learning in the classroom? Our next project down there will involve establishing a business where they will grow produce and fish for food and provide enough to sell so that they can provide for their families. Our students will help with the business plans as well as some of the market research. Internships will also be available in the future. We are excited to participate in these types of competitions. They offer unique opportunities for our students to continue learning about the marketplace and using business to serve, outside the classroom, in real life ways that impact real people. We are so proud of our SIFE team – they placed First Runner Up in the regional competition and will continue working on the New Horizons and Honduras projects for the rest of the year. 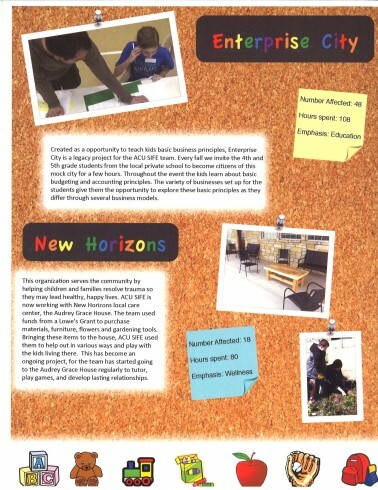 To learn more about the international, non-profit organization, SIFE, click here.